A Battello Wedding is perfect for couples who want breath-taking views of the Manhattan skyline without dealing with the hassles of New York City. Battello is a prime wedding venue, located in Jersey City and situated on the Hudson River. A Battello Wedding boasts amazing cuisine by one of New Jersey’s top culinary masters and floor-to-ceiling windows on all three sides of the dining room that can be opened in warmer weather. Battello provides a haven for dockside dining and cocktails during warmer months, along with electrifying views of lower Manhattan. In this Battello wedding photo, the bride and her bridesmaids each show off the bling of their rings. 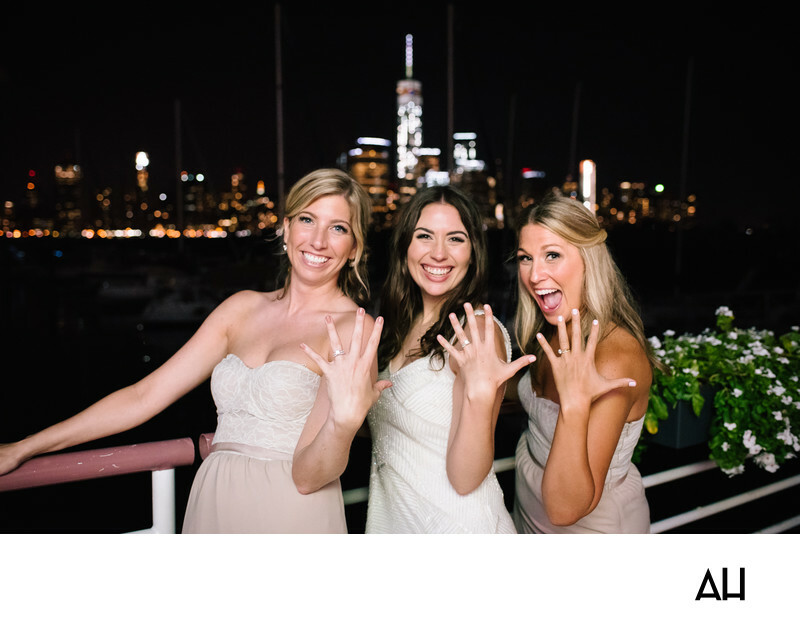 The twinkling lights of the New York City skyline match the sparkle of the rings, and the sparkle in the eyes of the three girls. The bride is at the center of the picture in a dress that glitters, with lines detailing the fabric to add to the shape and flare. The straps of her dress are comprised of strings of delicately twisted pearls and her dark hair falls loosely around her shoulders. In the background, sailboats float lazily on the dark water of the Hudson River and white flowers spill from a box on the dock’s railing. The bridesmaids are happy in love and happy for their friend on her own special day. They wear matching dresses with lace covered tops and pale blush colored skirts. The neutral color of the dresses make all three ladies stand out against the dark sky and water. It is a picture showing the friendship shared by the bride and her maids, and the love they have for one another.